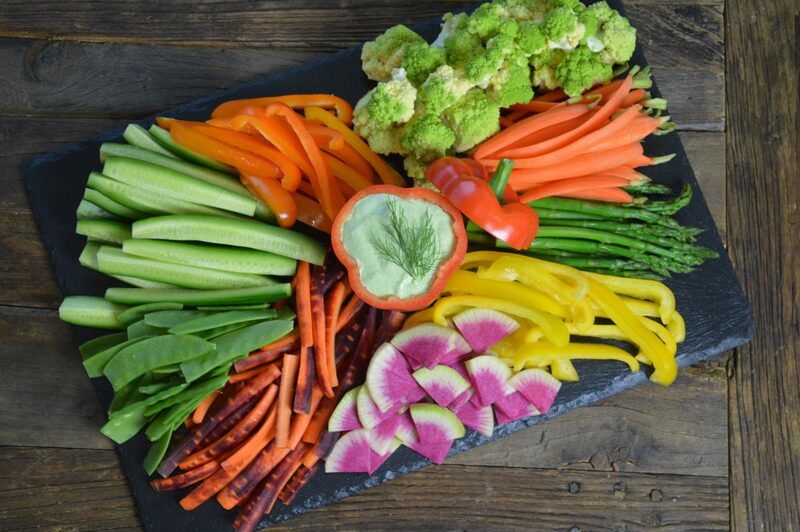 This modern crudite platter is perfect to serve at a party. There are so many beautiful vegetables at the farmer’s markets and it’s fun to be creative! I love the different types of carrots there are. Broccoli romanesco is also really cool. The flavor is nutty and a cross between broccoli and cauliflower. Persian cucumbers are light and delicious! Everyone loves snow peas and blanched asparagus. Watermelon radishes are also super beautiful. Have fun and go with the flow of what is in season. This green goddess is really flavorful and pretty too. The taste is light and the garlic gives it a zip!